In a lifetime of reporting, no one has ever asked Charles Wooley to go out and find ‘happiness’. Reporters get assigned to droughts, floods, earthquakes, wars and misery aplenty. But the elusive subject of human happiness? Where do you begin? In Australia, people are living longer and richer lives than ever; yet they’re still complaining. So Charles ventured forth on a strange journey of self-discovery to find out why we are so unhappy and how to put a smile back on our dials. See http://sixtyminutes.ninemsn.com.au/stories/8354017/the-pursuit-of-happiness for the full transcript of this segment on the pursuit of happiness featuring Laughter Yoga. This entry was posted in Blog, Laughter Insight Newsletter, Laughter News, Merv's Blog, Sebastien Gendry's Laughter Yoga Blog and tagged human happiness, laughter clubs, laughter yoga, pursuit of happiness on May 31, 2013 by Sebastien Gendry. The following is of interest and value to trained and able Laughter Professionals. From New Zealand: Builders find plenty to laugh about – 1) Call your local Convention Center and ask them about their upcoming calendar of events. They rent space to people in your target market. 2) Call the event organizers and/or visit the website for each event. Note that they usually do a call for presenters about 6 months to 1 year before the actual event. Apply to present! From Canada: Laughter Yoga in Schools – This one is just a reminder. There are plenty of schools everywhere. Call them and offer your services! From The USA: This Laughter Professional is offering a Laughter Yoga + Sound Healing evening. From India: This Laughter Professional partnered up with a poet and a Reiki Master for a happy evening. The lead: partner up with local professionals in non-competing yet complementary activities! Together you will be stronger and have more success. This entry was posted in Blog, Laughter Insight Newsletter, Laughter News, Merv's Blog, Sebastien Gendry's Laughter Yoga Blog and tagged laughter yoga, organizers, reminder, sound healing, target market on May 23, 2013 by Sebastien Gendry. In “A Whole New Mind: Why Right-Brainers Will Rule the Future“, Daniel Pink argues that business and everyday life will soon be dominated by right-brain thinkers. He identifies the roots and implications of transitioning from a society dominated by left-brain thinkers into something entirely different—although at times, he seems to be exhorting rather than observing the trend. As a narrator, Pink delivers in a well executed manner, with occasional hints of enthusiasm. He maintains a steady voice that is well suited for a business-oriented text, and his crisp pronunciation and consistent pace keeps listeners engaged and at ease. Guess what: there is a whole chapter in this book extolling the values and virtues of Laughter Yoga. Read extracts here. This entry was posted in Blog, Laughter Insight Newsletter, Laughter News, Merv's Blog, Sebastien Gendry's Laughter Yoga Blog and tagged laughter yoga, right brain thinkers on May 20, 2013 by Sebastien Gendry. 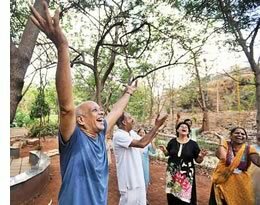 The American School Of Laughter Yoga was started in 2004 by Sebastien Gendry and played a major role in introducing the Indian laughter yoga exercise regime in North America. It continues to play a major role in social laughter clubs. This entry was posted in Miscellaneous and tagged laughter yoga, oprah winfrey show on May 16, 2013 by Sebastien Gendry.